Work: Member of first Maryland Committee of Safety, Provincial Congress, 1775; Delayed member of Continental Congress, August, 1776, Signed Declaration of Independence; Appointed to board of War, 1776; Elected to Senate of Maryland, 1781; Elected U.S. Senator from Maryland, 1788, returned to Maryland Senate 1789-’99. Charles Carroll was born into a wealthy Roman Catholic family in Annapolis Maryland. He began his rather remarkable formal education at the age of 8, when he was packed off to France to attend a Jesuit College at St. Omer. He graduated the College of Louis the Grande at age Seventeen and continued practical studies in Europe until, at the age of 28, he returned to his home. Into the radical climate produced by the Stamp Act, walked a Highly refined Gentleman with all of the education and experience that might be expected of an emissary of the finest courts in Europe. Charles Carroll is said to have identified with the radical cause at once, and he proceeded to work in the circles of American patriots. In 1772 he anonymously engaged the secretary of the colony of Maryland in a series of Newspaper articles protesting the right of the British government to tax the colonies without representation. Carroll was an early advocate for armed resistance with the object of separation from Gr. Britain. However, his native colony was less certain in this matter and did not even send a representative to the first Continental Congress. He served on the first Committee of Safety, at Annapolis, in 1775, and also in the Provincial Congress. He visited the Continental Congress in 1776, and was enlisted in a diplomatic mission to Canada, along with Franklin and Chase. Shortly after his return, the Maryland Convention decided to join in support for the Revolution. Carroll was elected to represent Maryland on the 4th of July, and though he was too late to vote for the Declaration, he did sign it. He served in the Continental Congress, on the Board of War, through much of the War of Independence, and simultaneously participated in the framing of a constitution for Maryland. In 1778 he returned to Maryland to participate in the formation of the state government. He was elected to the Maryland Senate in 1781, and to the first Federal Congress in 1788. He returned again to the State Senate in 1790 and served there for 10 years. He retired from that post in 1800. 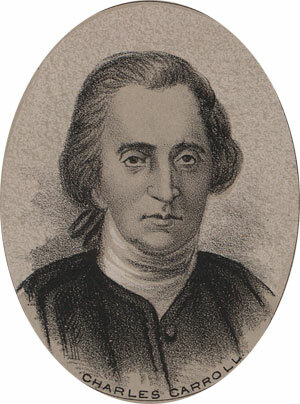 Charles Carroll was the last surviving member of those who signed the Declaration. He died, the last survivor of the signers of the Declaration, in 1832 at the age of 95.